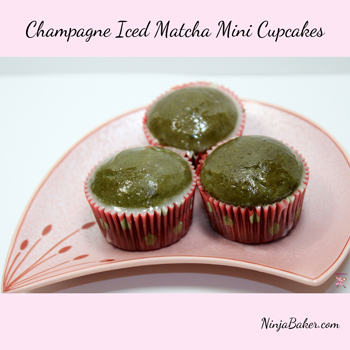 Whispers of champagne and matcha mingle in the Ninja Baker’s Champagne Iced Matcha Mini Cupcakes. Matcha boosts metabolism and burns fat! Sooo, you can pop the Ninja Baker’s Champagne Iced Matcha Mini Cupcakes into your mouth without a care about calories. Yields approximately 68 mini cupcakes. Divide the batter between the mini cases in the cupcake tins. Bake for 16-18 minutes or until a toothpick inserted into the cupcake centers comes out clean. Whisk together 1½ cups of powdered sugar with 5 tablespoons of champagne. Dip cooled cupcakes into Champagne Icing.